To ensure a quick cook time, preheat your oven before you start cooking. Preheat to 180°C on fan force or 190° if you’re oven doesn’t have a fan. The easiest way to spatchcock the chicken is to use a good set of kitchen scissors. Lay the chicken, breast-side down on a cutting board. Cut along either side of the spine, using the parson’s nose as a guide. Cut through the little rib bones, all the way to the top of the spine. You won’t be using the spine in this recipe so you discard it or you can keep it to make stock. 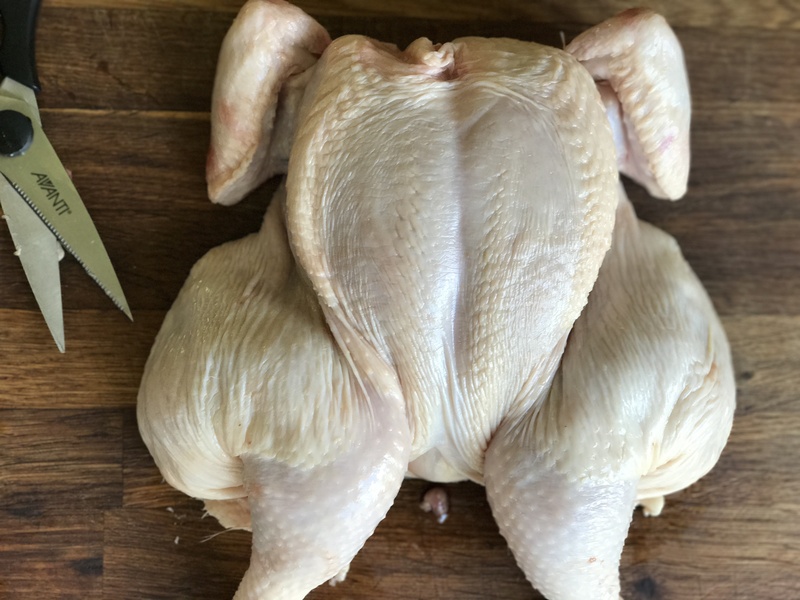 Once you have cut the spine away, open the chicken out then turn it over and using the palm of your hand press down on the chicken breast to flatten the chicken a little further.